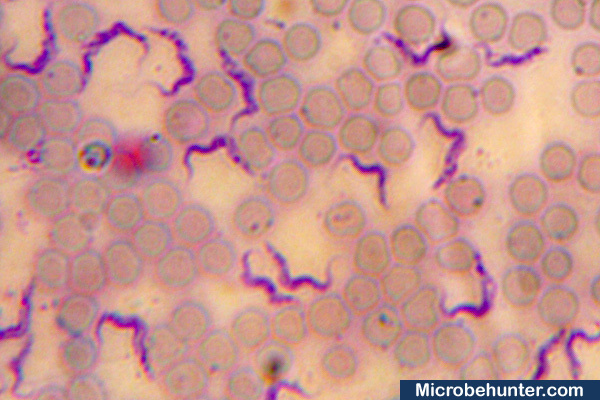 Trypanosoma brucei is a single celled parasite, which causes the sleeping sickness. The parasite is spread over insects, particularely the tsetse fly. The parasite is transferred to the host animal when an infected tsetse fly bites a host animal to feed on blood. The parasite cells reproduce in the tissue of the host and then move to the lymphatic system and the blood, were the continue to reproduce. The image shows numerous parasites (purple) surrounded by red blood cells. The parasite can also attack the nervous system, which then causes the symptoms of the sleeping sickness. Trypanosoma brucei gambiense is a blood parasite causing the sleeping sickness. Commercial permanent mount. Great article… Love reading this..
Nice photo and article. I really like these short e-mail posts about various items of interest. Thanks, Oliver ! great photo. Is there any where that i can purchase blood infected with this parasite, Trypanosoma brucei as I make microscope slides for teaching purposes. They sell microscopy slides for education.